Two years today you left us with broken hearts. We miss you today and will forever. 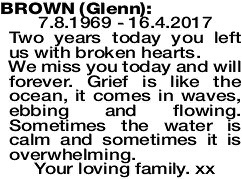 Grief is like the ocean, it comes in waves, ebbing and flowing. Sometimes the water is calm and sometimes it is overwhelming.